Online casino software developer Evolution Gaming is widely considered the world’s leading provider of of live dealer casino games. 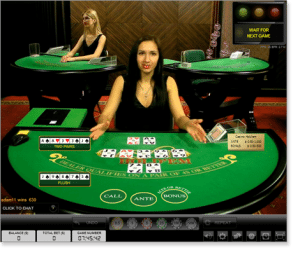 Streaming high quality video feeds directly to our computer screens, Evolution Gaming powers some of the most popular interactive titles, such as roulette, blackjack, baccarat, three card poker, and casino hold’em. Mucho Vegas and Jackpot City Casino are our top two rated real money online gambling sites which work with Evolution Gaming to offer some of the most innovative and highest quality live dealer casino games on the World Wide Web. Accessed instantly directly through our browsers – no downloads required to play – the games run smoothly, and the highest standards of security are followed in order to make gaming as enjoyable as possible. Live Roulette: Ranging from $0.10 through to $50,000 bets. Live Blackjack: Ranging from $5 to $5,000 bets. Live Baccarat: Ranging from wagers of $1 through to $2,000. Live Casino Hold’em: Ranging from $0.50 through to $1,500 wagers. Live Three Card Poker: Ranging from bets of $1 to $3,000. The Betting interface is unique and easy-to-use with rich features, and we are provided with a high quality player experience. Enjoy the ability to chat in real-time with professional dealers who will respond to you personally, as well as other players. Evolution Gaming has introduced Perfect Pairs and 21+3 side bets to its live blackjack games, and has one of the widest range of betting limits available in the live dealer market. Founded in 2006, Evolution Gaming became the first European company to achieve the eCOGRA (eCommerce Online Gaming Regulation and Assurance body) Certified Live Dealer Seal, and has since rivalled, and many would argue, bettered, other developers such as Microgaming. With its own dedicated live studio complexes in Riga and Malta, Evolution Gaming operates more live table games than any other land-based operator in Europe. All gaming activity is monitored and regulated by trained and certified adjudicators, risk managers and chat moderators. This ensures the highest safety and security standards, and guarantees the swift and effective resolution of any technical, player or other issues. Evolution Gaming’s live croupier titles have been proven to attract more high roller players than online RNG casino games, has itself been proven to be a trusted live dealer gaming provider and operator which complies with all important regulatory requirements involved in the gambling industry. Streaming live games from its studios at licensed land-based casinos is another unique offering from Evolution Gaming. Try the live games yourself at Mucho Vegas Casino and experience the excitement you get from an interactive, real time casino.